Recently relocated from Seattle to Tucson, Jeff Greinke is a multi-instrumentalist, composer, sound sculptor, and visual artist known worldwide as an early pioneer of ambient and “Fourth World” music. Through a highly developed process of layering, Jeff composes and performs music rich in texture, depth, mood, and subtle detail. Using various acoustic and electronic instruments, found sounds, and extended studio techniques, Jeff sculpts sound worlds that conjure a strong sense of place, hovering somewhere between the exotic and the familiar. 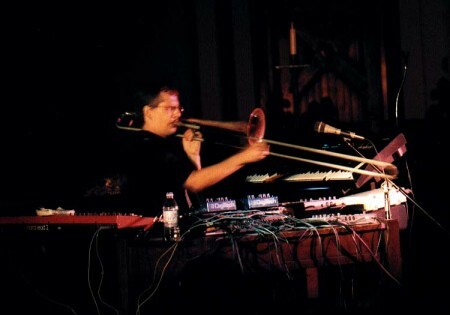 Tonight he presents an evening of solo music for keyboards, electronics, trombone, and voice. Jeff Greinke began composing and performing music in 1980 while studying meteorology at Pennsylvania State University. After moving to Seattle in 1982, Jeff formed the production company and recording label, Intrepid, through which he produced his first LP, Cities in Fog. He has since released twenty other recordings on various U.S. and European labels. His recent work is released on FWD, a label and distribution network he co-owns with three other musicians. Jeff’s music can also be heard on numerous compilation recordings. He has composed music for film, video, dance, theatre, radio, and art installations. His music was used as the soundtrack for the trailer of Ron Howard’s film The Missing. Jeff has toured extensively throughout the United States and Europe and has performed in China, Canada, and Mexico. He has also been a member of numerous ensembles and is founder of the group LAND, featuring Lesli Dalaba (trumpet), Dennis Rea (guitar), Bill Rieflin (drums), and Fred Chalenor (bass). LAND toured China in 1996, which included playing the prestigious Beijing International Jazz Festival. They have released three albums. Jeff also has a collaborative duo with former Sky Cries Mary vocalist Anisa Romero called Hana.